Macedonia’s prime minister said Wednesday (30 January) that in addition to changing his country’s name, his government was ready to enact further reforms to speed up the start of EU accession talks. “We hope that by June we will have presented strong arguments to the European Council for getting a date for opening accession negotiations,” Zoran Zaev told a press conference in Vienna. Zaev said he was “confident” his country could in that time show “progress in the area of the rule of law and starting judicial reforms”, as well as the fight against corruption and organised crime. Macedonia and Greece ratified this month an agreement that paves the way for Macedonia to be renamed the Republic of North Macedonia, thereby ending an almost 30-year dispute between the two neighbours. The row had for years stymied any prospect of Macedonia joining the EU or NATO. “We believe in European values, more so than some people in member states,” Zaev said. 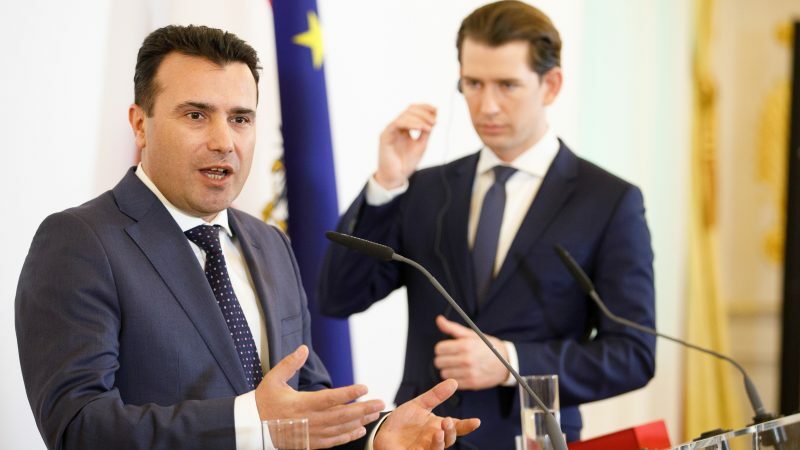 Zaev spoke alongside his Austrian counterpart Chancellor Sebastian Kurz, a keen proponent of EU entry for the countries of the former Yugoslavia. However, Kurz cautioned that “fixing a concrete date (for Macedonia’s entry) would not be sensible”. “This depends on conditions that must be fulfilled and progress that must be made but I see firm determination (from Macedonia),” Kurz added.